Image segmentation is defined as a partition realized to an image into homogeneous regions to modify it into something that is more meaningful and softer to examine. Although several segmentation approaches have been proposed recently, in this paper, we develop a new image segmentation method based on the statistical confidence interval tool along with the well-known Otsu algorithm. According to our numerical experiments, our method has a dissimilar performance in comparison to the standard Otsu algorithm to specially process images with speckle noise perturbation. Actually, the effect of the speckle noise entropy is almost filtered out by our algorithm. Furthermore, our approach is validated by employing some image samples. 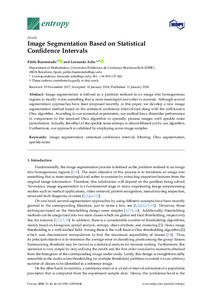 Buenestado, P., Acho, L. Image segmentation based on statistical confidence intervals. "Entropy: international and interdisciplinary journal of entropy and information studies", 11 Gener 2018, vol. 20, núm. 46, p. 1-12.